Finally, I did another city trip! This time it wasn’t the warm and sunny Spain, but the beautiful (and chilly) North, more specific Sweden and to be really specific: Stockholm! The main reason for this trip wasn’t checking out all the vegetarian options nor enjoying Sweden’s wintery darkness; the real reason listens to the name Dries, who is my best-veggie-friend-ever and who is studying in Sweden since August. 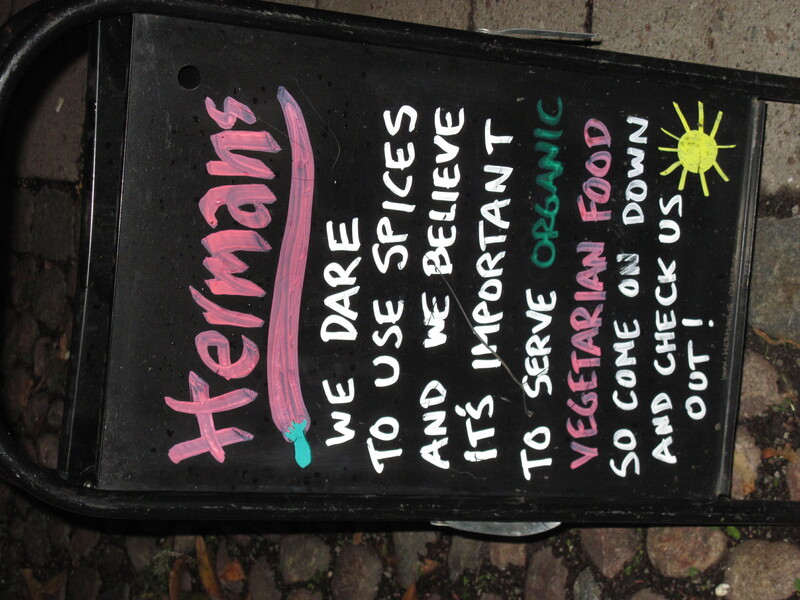 Because Dries had already been living there for more than two months I didn’t have to look for vegetarian restaurants in advance, he already discovered some places. 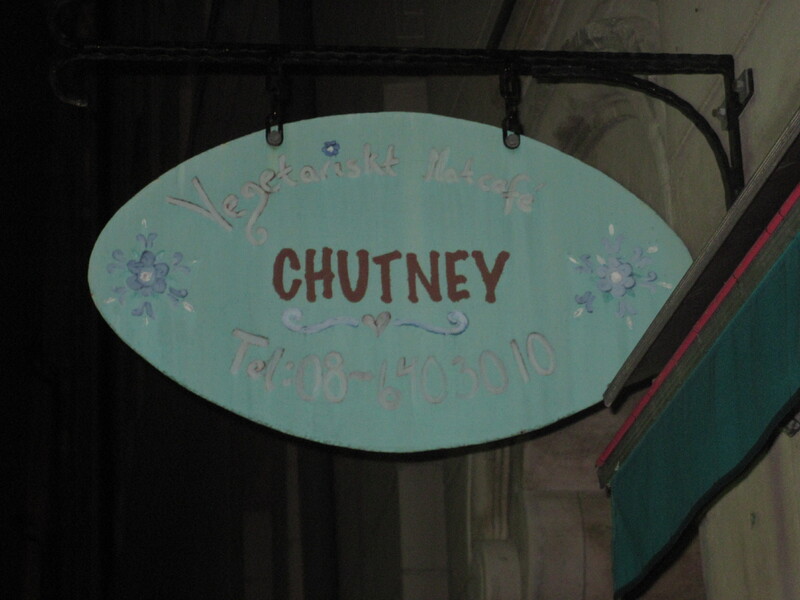 The first restaurant was called Chutneys and was situated in the trendy district of Södermalm. The interior of this restaurant can be described as a really cosy basement with an indian touch. This Indian touch is also to be found in the dishes being served. They offer an à la carte menu but most people go for one of the four daily suggestions (of which 2 are vegan), for which you only pay 93 SEK (around €10). Water, coffee and tea are free as in almost every Swedish restaurant and also free access to the salad bar and(delicious!) bread was included. I choose for a dish with quinoa. To be honest, it was probably the best quinoa dish I’ve ever had. It was absolutely delicious. Besides quinoa, there were a lot of different oriental vegetables on my plate and the combination of all those ingredients made the dish really tasteful. Unfortunately, the dishes were quite big, which made my tummy so full that there wasn’t any space left for one of the desserts which were displayed and looked delicious as well. Such a pity! 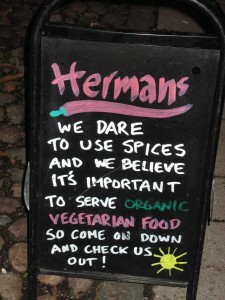 The vegetarian restaurant Hermans, located on Fjällgatan, is quite famous in vegetarian Stockholm. Students love this restaurant because of its special offer: 2 students can eat for the price of 1 on the condition that they take one drink each. Money-wise, this means that you pay 113 SEK ( a bit less than €13) for one drink and (now comes the best part) full access to the buffet! The buffet contained a variety of soups, bread, salads, pasta, potatoes, … and a delicious vegetarian lasagna (my favorite!). It is best to book a seat in advance, especially on Monday when they have another special offer (95 SEK for students). If you are lucky, you have a seat in the veranda with a nice view on the city. Not a vegetarian restaurant but also a really nice place to go in Stockholm is Lilla Caféet på Söder, a coffee bar which gives you the same feeling as your own living room. A perfect place to warm yourself after a (cold) walk through Stockholm. The owner is really friendly and her homemade cakes and brownies are delicious. The coffees are also possible with soy milk: just ask. More information on their facebook page.